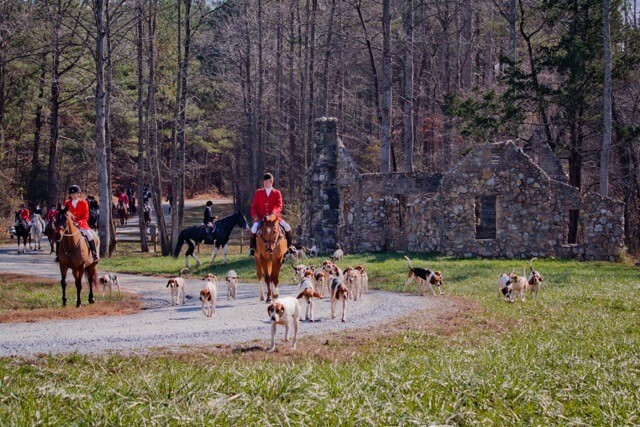 The Carolina Foothills are the perfect backdrop for foxhunting. Tony and Madelon raised their daughter, Megan, on Fairview Farms. “Now I have a 2 1/2-year-old granddaughter, Scarlet, who lives with her mom and dad in San Francisco, so I see a pony in my future for her!” Madelon shared. 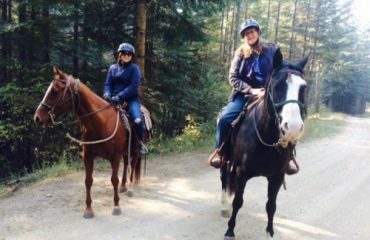 She stopped riding when responsibilities became too much as a realtor — which soon included conservation projects. To date, Madelon has helped to protect over 2,000 acres in the Carolina Foothills from development and was a key player in a community-wide effort that persuaded a large power company to abandon plans for a major transmission line through the area. 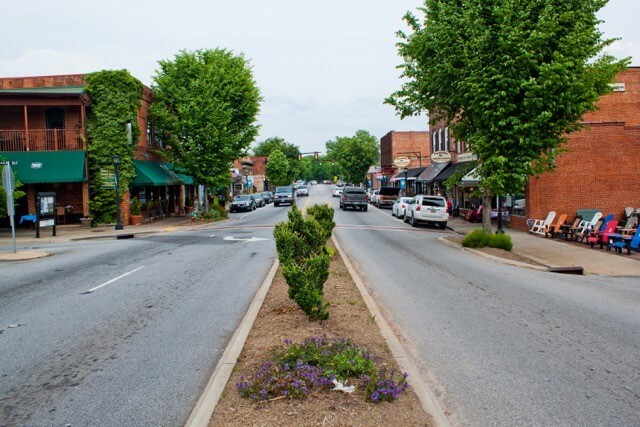 “Our area, now known as the Carolina Foothills, is four towns in three counties and two states, but we’re one economic and cultural area, and the heart of the Foothills Horse Country.” Madelon’s passion for the unique community makes her the perfect candidate to share a few of the wonders to be found in Tryon, Columbus and Saluda, North Carolina, and Landrum, South Carolina. 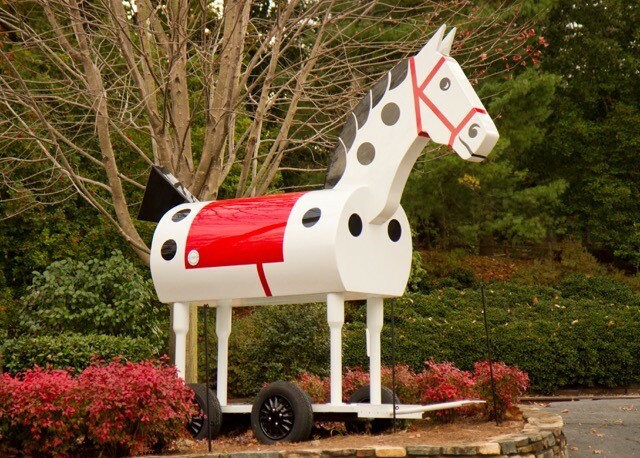 Morris the Horse is a popular landmark in Tryon, South Carolina. For some of those specialty ingredients, Landrum’s Stone Soup is Madelon’s top choice — as well as for take-out, lunch, dinner and even cocktails. “Stone Soup is full of the ‘horsy’ feel of the area, with the walls full of horses and people you know, some of whom you’ll meet.” The whole family can enjoy Stone Soup — including canine members. “It’s owned by a good friend, Suzanne, who just put in a local dog park in the extensive backyard so there’s activity there all the time.” Eat out back with your favorite pup, or grab a frozen dinner and accompanying fresh-baked goods and take it home. If you’re staying for dinner, Madelon loves the Southwestern Salad with Blackened Shrimp, as well as the new favorite, Arugula and Pear Salad with Caramelized Walnuts. Another Landrum favorite is Southern Delights & More, an ice cream and sandwich shop. “I love their corn and shrimp chowder,” Madelon shared. 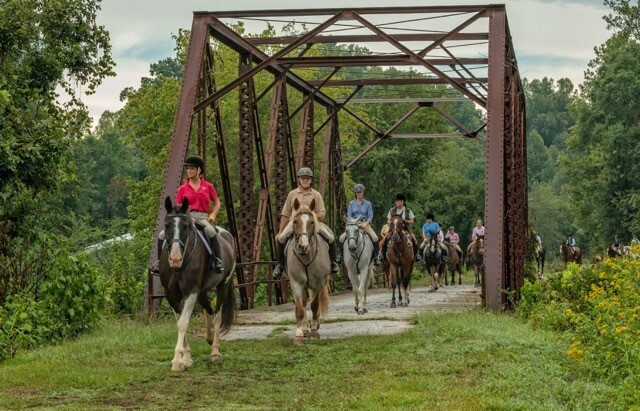 Enjoy the Carolina Foothills from horseback on a trail ride. 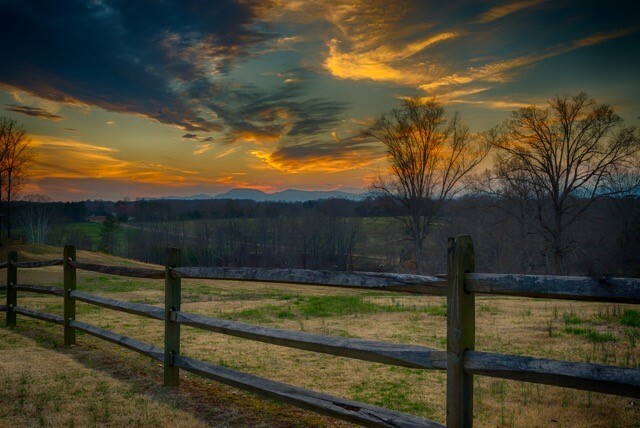 Gorgeous views greet visitors in the Carolina Foothills. 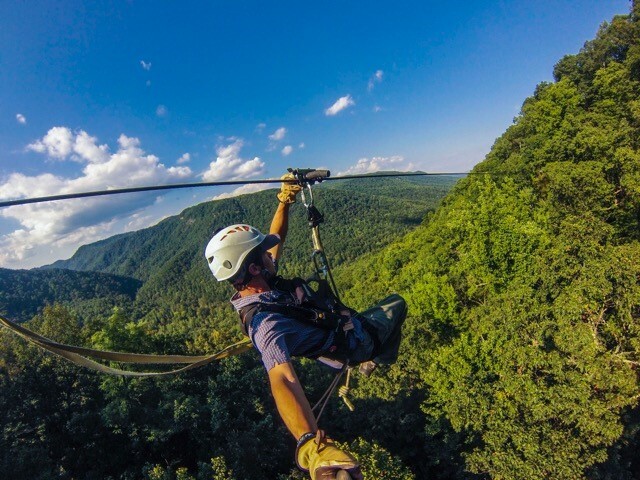 For the adventurous, ziplining through the Blue Ridge Mountains can be quite a thrill. Of course, one of many area crowning jewels is the horse shows. 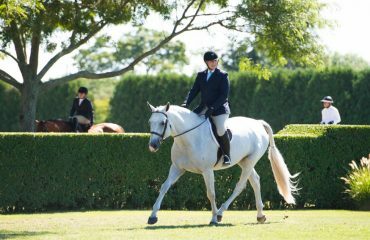 “This area is full of equestrian tradition,” Madelon shared. 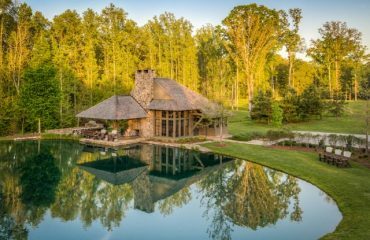 “We have two local and area show venues, Harmon Field and FENCE, and now the new Tryon International Equestrian Center. 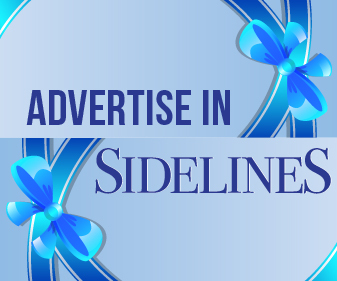 Whether you’re just starting a young horse or a young child or are a regular A-circuit competitor, there’s something here for you. The two local venues have that local flavor that so many big shows just no longer have. However, when you can and want to compete at the highest level, we now have that, too, with the new equestrian center. 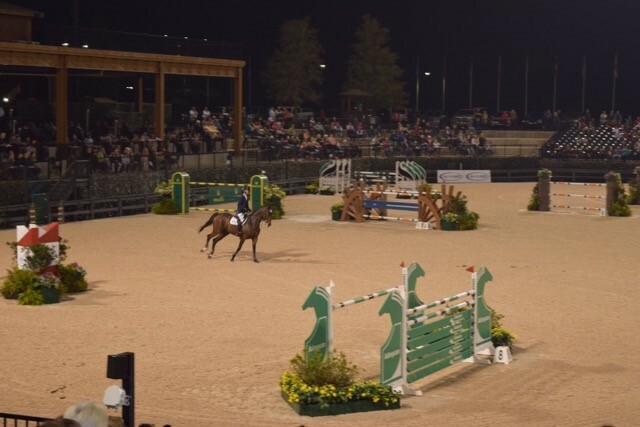 Saturday Night Lights at Tryon International is a big thing locally and is usually packed with families both local and from neighboring cities.” Tryon International Equestrian Center will be home to the 2018 World Equestrian Games, attracting the top equestrian athletes from around the world. Saturday Night Lights at the Tryon International Equestrian Center. 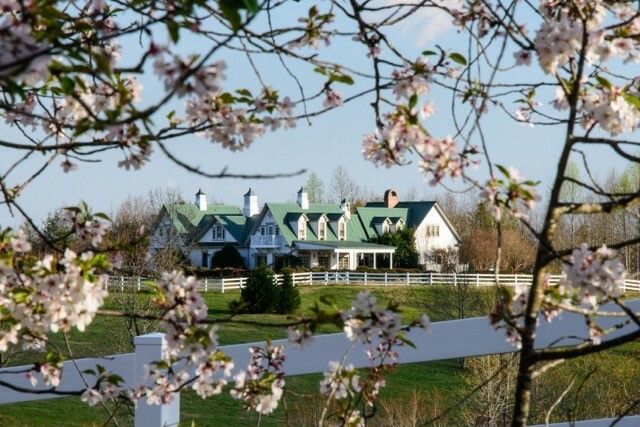 The Red Horse Inn in Landrum was voted one of the nation’s most romantic hotels. For more information and to plan your trip, visit ourcarolinafoothills.com.